The shotgun can rightfully be called the 'ugly sister' of the rifle. This has nothing to do with the outward appearance of the particular type of firearm compared to the other but more to do with the way in which each gun goes about destroying real estate. A rudimentary rifle can be counted on to propel a single projectile to several hundred yards with enough precision to burst a beer can, harvest a deer or physically deter a human attacker. Oppositely, the crudest of shotguns can be counted on to throw anywhere from one to several hundred projectiles at a target, per trigger pull, up to perhaps 50 yards distance. Rifles are excellent guns, if you can hit the target and need the ability to shoot to longer ranges. Shotguns dominate close quarters shooting, if no body armor is involved. But the primary limitation on shotgun usage is shooting beyond 50 yards — at this point the shot pellets, depending on the choke used on the barrel, have spread out to the point that only a few will hit the target. Due to the large number of projectiles fired per trigger pull, the shotgun has a considerably higher hit probability than rifles and pistols in high-stress shooting situations — but the fact that a shotgun fires a swarm of spheres towards the target is no excuse not to focus on marksmanship. A myth that still, dangerously, pervades the world of small arms is that 'you just point a shotgun and you will hit the target'. This is true to some extent — the close ranges (less than 7 yards) that are typical of defensive shootings allow for satisfactory results by using muscle memory to aim and relying on the spread of the shot pellets to compensate for aim error. But what happens if Murphy makes his appearance on your rainy day, and you have to engage a subject that is using cover and/or is a significant distance away from you? This is the time that you will have to aim your shotgun and apply the same marksmanship techniques used with rifles, if you are to have any chance of incapacitating the hostile subject(s). But even the most highly skilled marksman cannot hit the target if their weapon is not sighted in such that the point of aim is the same location as the point of impact. This essay will show you how to determine the point of impact for your shotgun using buckshot, slugs or birdshot. The technique presented also applies to sighting in a rifle and determining the group size of a particular type or lot of ammunition fired from your rifle. 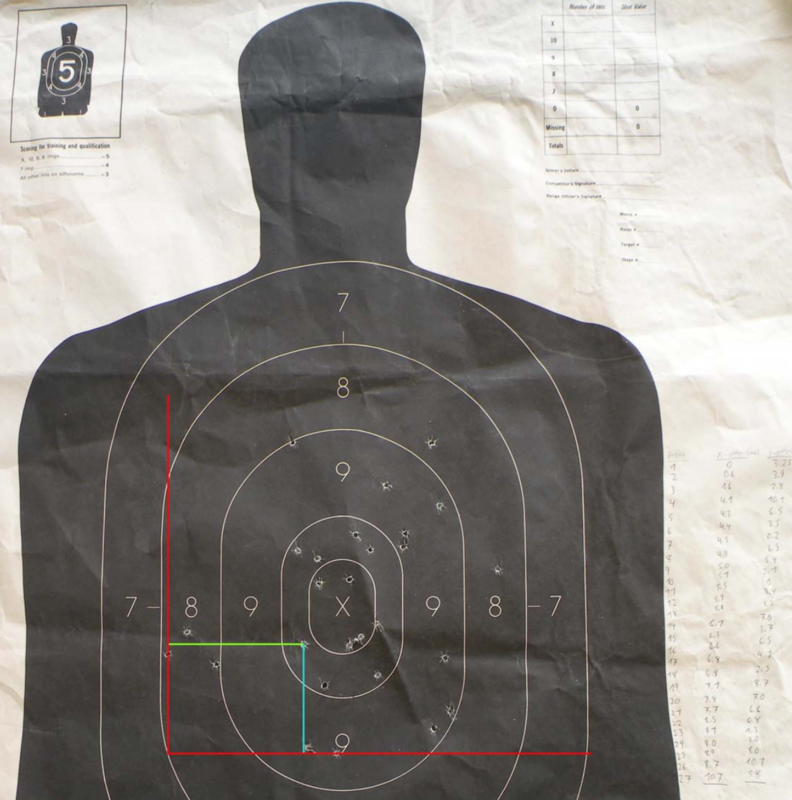 For this technique, the number of shots fired is very important — the more shots you fire and targets you measure, the more certain you are to sight your shotgun in correctly. To do this, I would recommend a minimum of 3 shots/targets per sight adjustment. Fire one shot and change the target. Choose the engagement range you feel is typical for your situation, that is still close enough such that you have a crisp view of the target bullseye. If you can mount the weapon in a mount or rest it on sandbags, it is best to do so. In a nutshell, what we are trying to do is to measure the vertical (Y axis) and horizontal (X axis) distance of each shot pellet from a reference point that we physically draw on the target. Once those distances are measured, the X distances for each pellet are to be averaged and the Y distances are averaged as well. This gives us the average point of impact for each target. Locate the leftmost hole and the hole furthest towards the bottom of the target. Using a straight-edge, draw a vertical line through the center of the leftmost hole. Draw a horizontal line through the center of the bottommost hole. Ensure that these lines (the red lines in the image) extend up past the topmost hole and far enough right past the rightmost hole, as you will be using the red lines to measure off of. I find it easiest to write three columns on the target I'm measuring: Shot 'X' and 'Y' and just write each measurement as I make it. For the example in the photo that we are calling 'Shot 1' the 'X' column is represented by the distance going straight across from the vertical red line to the center of the hole that we are measuring. It's the same way with the 'Y' column — this is the distance going straight across from the horizontal red line to the center of the hole we are measuring. Repeat this process for each of the remaining shot holes. Once you have all of the shots measured, add up the numbers in the 'X' column and divide this number by the number of shot pellets that you measured off of the target. Repeat this process for the 'Y' column. You now know the average point of impact for your shotgun on this particular shot. The number of shots that you fire from this point should reflect the amount of importance you place on getting your shotgun sighted in. At a bare minimum, please shoot 3 targets and measure them as described above, to determine where your shotgun is shooting. But, Moore's is well in effect here — More is Better. More shots are better, because they give you more information about where your shotgun is actually shooting. For those with a shotgun with an adjustable sight, it should not be difficult to adjust your sights to get your point of impact matching your point of aim. Consult your owners manual if you have any questions about your particular gun. If you are using this method on a weapon with a bead front sight, you can still get your gun ready to run. But doing this may involve trying a few different brands/loads of shotshell in your chosen shot size. Different manufacturers use different propellants, wads and buffering methods in their shells, so your results will vary from brand to brand. Once you find the shell that shoots the closest to where you are aiming, you can either walk away happy or learn to compensate your hold for the point of impact. It's the classic method of 'if it hits high, hold low', etc. There's nothing wrong with this technique if it is the best option available to you at the time. Once you have sighted your shotgun in to your satisfaction, every shot pellet that you fire from that point onward (using the exact ammunition load and choke that you sighted the gun in with) will be grouped around the point that you are aiming the gun when you pull the trigger. In the above-mentioned instance of shooting the shotgun at long distances (where the pellets have spread out too far to be considered effective fire by most), you have now greatly increased your probability of hitting the target with at least a few pellets, since the cloud of shot will be centered around the aiming point that you have set. Don't discount the lethality of shot pellets at extended ranges either: at the muzzle a #4 buckshot pellet travels at 1325 ft/sec, when fired from a standard 12 gauge 2 ¾" shell At 100 yards from the muzzle, the average velocity for the same #4 buckshot pellet is 1150 ft/sec. This is about like getting shot by a .25ACP...helped along by a 239 mile per hour tailwind! Larger shot sizes will have better velocity retention and penetration into a soft target. The other benefit of this new-found capability of your shotgun is that you now have a much higher probability of hitting small targets at normal distances, with buckshot and birdshot. If you have the misfortune of having to enter into combat against a person or persons with combat experience, they will likely be utilizing cover in order to protect themselves from the effects of your fire. As mentioned earlier, a big drawback to shotguns is that buckshot pellets are notably inefficient at penetrating light cover found in close-in fighting, such as car doors and windshields. That is not to say that a person using such light cover is effectively shielded from your weapon effects — it is to say that the lack of lethality of the pellets that do make it through the cover, ensures that you will have to burn up a lot of shotgun shells if you are using a shotgun to neutralize a target using light cover. It's much better to focus on the strengths of the shotgun — destroying soft targets. If the adversary is properly using cover, your only chance to stop them may be hitting them in the face and/or hand when they briefly swing out from cover to shoot at you. In this case, the more shot pellets you can get flying towards something vital, the more chance you will have to incapacitate the target. I hope this information finds you in good health and happiness. The work described above should take no longer than 3 hours for one person to sight in one shotgun. We often take for granted that, if we should ever have to use a firearm in a combat situation, it will not occur on a bright sunny day with a mild breeze and us fully rested and alert. It will occur when you least expect it, in what usually ends up being conditions unfavorable to you and favorable to your attacker(s). Let us make use of the blessings of science and due diligence to help us be better prepared to face the challenges that will face us in the future.